The founding techy-musicians of AirTurn, Inc. once marveled at the idea of a performer seamlessly turning their own pages. In 2008, passion for enhanced performance combined with conviction for a revolutionary solution, led to the creation of the AT-104, a USB-interfaced proprietary wireless device for turning and scrolling pages on computers. It was paired with the BOSS FS-5U momentary switch to provide foot activation, and MusicReader PDF software for PC for viewing scanned copies of traditional sheet music. Early adopter interest was high with this introduction and proof of concept for a previously non-existent marketplace. With the release of the Apple iPad in 2010, it was imperative to become compatible with this new more portable technology. Therefore, the Bluetooth-enabled BT-105 transceiver was created to add compatibility with the iPad. In response to feedback from the classical performance community, development of a new silent operation switch also began. Using raw plastics, an assortment of craft tools, and some tiny magnetic relay switches, the ATFS-1 silent footswitch was born in the basement of a mountain home in Nederland, CO. This popular product went through several variations, including black, clear, and the ever-favorite cork-on-clear. The sleekness and silent operation of the new foot switch combined with the versatility and portability of the new transceiver/tablet setup catapulted the company forward. Over time it was clear that customers needed an option to keep the setup contained together during performance and travel, so the first pedal board was cut by CNC from raw polycarbonate. The BT-105 transceiver and ATFS-1 foot switches were attached using hook and loop tape to provide one consolidated device. Due to increasing popularity and demand, the foot switch and pedal board products were reengineered for injection molded production. Textured surfacing and press-fit assembly were added, and the first professional-grade parts were released to market in 2012, the ATFS-2 and ATPB-2. These parts together eventually became known as the DUO, our absolute top selling product and the best rated Bluetooth transceiver on the market today. As the tablet market continued to grow with the iPad2 and the entry of Android, many customers found the need for better tablet mounting solutions. While there were some options available at that time, nothing seemed to fit a universal model with necessary durability. Therefore, the Manos universal tablet holder was developed using high-quality injection molded parts to meet the needs of most customers for tablet and smartphone use. With very few modifications over the years, this product remains one of our best sellers and a staple in the industry. Demand continued to rise, and customers expressed the need for a more portable and complete setup. In response, the collapsible Gostand and Boom products were created, providing shorter and lighter options, specifically to fit a standard backpack. This addition created a well-rounded product offering and complete solution package. 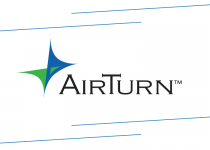 After moving through several transitional locations, AirTurn is now located in a fully operational warehouse space in Boulder, CO, and employs approximately fifteen people. Staged for continued growth, the future is quite promising. Presently on the 3rd generation of transceiver product built from ten years of industry experience, AirTurn now offers the broadest Bluetooth communication platform available, including advanced user customization and MIDI control. Variations have been developed to meet the needs of most users, including silent operation, touch or tactile response, and multiple switches. 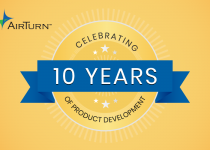 With the recent launch of the S-Series, AirTurn anticipates growth into new markets and is excited to continue providing cutting-edge performance products and Bluetooth solutions for an ever-changing technological world.